Many people love a bargain. And most people love the stores that give it to them. Dollar stores, or deep-discount retailers, have favorability ratings of more than 60 percent according to Morning Consult Brand Intelligence. But the dollar stores also ranked high in another category: positive community impact. Sixty-two percent of U.S. adults said Dollar Tree Inc. has a positive effect on their community, while majorities said the same of Family Dollar (57 percent) and Dollar General Corp. (56 percent), according to Morning Consult’s Community Impact Rankings. All three stores rank among the public’s top 15 brands for “positive community impact,” alongside well-known institutions such as UPS Inc., Amazon.com Inc. and Wal-Mart Stores Inc. The numbers can be seen as evidence of persistent but quiet campaigns from each dollar store brand, in which they prioritize local neighborhoods over national giving, experts said. 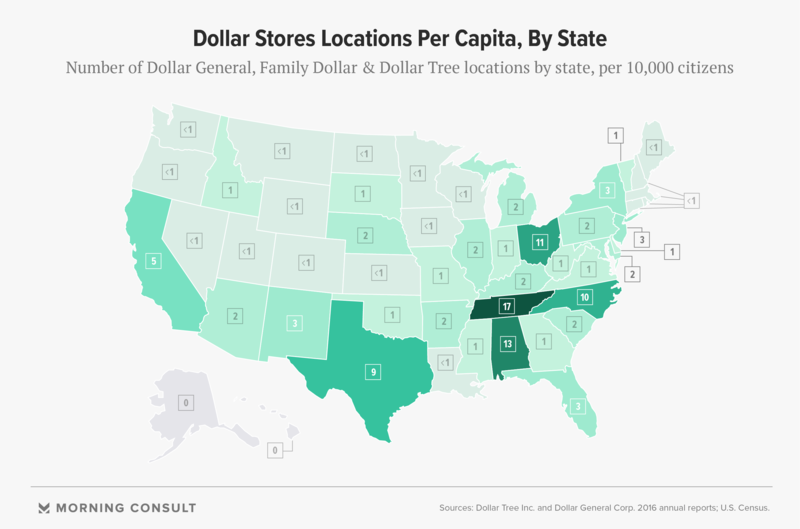 Dollar stores also outnumber Wal-Mart stores roughly five to one. Discount retailers have long been a part of Americana, catering to the financially mindful consumer. The F. W. Woolworth Company’s stores, one of the original “five-and-dimes,” were founded in 1879. Dollar stores usually boom during times of economic instability, said Louis Hyman, director of the Institute for Workplace Studies at Cornell University, in an Oct. 23 interview. The first J.L. Turner and Son Wholesale store, which would later evolve into Dollar General, opened in Scottsville, Ky., in 1939, on the heels of the Great Depression. Dollar stores again flourished during the Great Recession, according to analysis conducted by John Strong, a professor of business, economics and finance at the College of William & Mary. And the stores continue to prosper after the recession, as people still value lower-priced options. Dollar stores not only have the quantitative edge, but the stores engage with local communities in a way Target and Wal-Mart do not, Strong said in an interview on Oct. 24. “Each of the three dollar stores have thought pretty carefully about their community support strategy — and they’ve localized it,” Strong said, noting that this strategy is “almost 180 degrees” from that of bigger retailers, which donate larger sums of money to national or international organizations or causes. For example, Wal-Mart has given more than $35 million to the American Red Cross since 2007, and announced in August that it would donate up to $20 million for Hurricane Harvey victims. The public also has favorable views of Wal-Mart’s community offerings. Sixty-five percent said the company has a positive impact — but another 13 percent said it has a negative one. Strong attributes this to the idea that Wal-Mart siphons sales from local, downtown retailers, though he said discussion has slowly pivoted to place more blame on Amazon. The dollar stores offer different charitable contributions: Dollar General puts much of its giving into the Dollar General Literacy Foundation, a nearly 25-year-old program aimed at helping employees and customers within 20 miles of its stores tackle education and literacy issues; Dollar Tree generally focuses on assisting military families and helping finance employees’ collegiate goals; and Family Dollar concentrates on small grants to local community groups that provide basic necessities, such as local food banks. Each of the three dollar stores have thought pretty carefully about their community support strategy — and they’ve localized it. But you won’t find every clothing drive on the dollar stores’ press pages. These small contributions are usually felt around the corner — not read across the country. “I don’t think it’s part of the culture of those companies to say, ‘Look at what we’re doing,’” said Strong. Dollar stores also provide employment to rural areas that might not have many jobs, especially opportunities that offer advancement within a larger corporation, Strong said. “We give back to the communities who support us,” a Dollar General representative said during an Oct. 24 interview when asked about localized giving. All three dollar stores ranked within the top 10 brands on community impact among those making less than $20,000 per year, per the Morning Consult rankings. The stores disappear from top 10 lists among those making $75,000 or more. Much of that may have to do with location. The stores strategically set up in predominantly low-income neighborhoods, Elizabeth Racine, an associate professor of public health at the University of North Carolina at Charlotte, said in an interview on Oct. 23. The average family that shops at dollar stores makes less than $50,000 a year, according to a 2015 study. Residents from Southern states viewed all three dollar stores more favorably than the public overall, with more than 6 in 10 saying the stores have a positive community impact. Midwestern residents’ attitudes were roughly the same. Those living in the Northeast and West, however, did not rank their positive impact as high, with positive perceptions of the stores in the mid-50 percent range. The rankings also found that those living in rural communities score all three dollar stores disproportionately high. More than 6 in 10 rural residents said Dollar General, Dollar Tree and Family Dollar have positive impacts on their communities, while suburban and urban residents’ average ranking lands in mid-50s. Less than 5 percent of rural residents said the stores have a negative influence. “There are very few stores that have access to national suppliers in rural communities,” Hyman pointed out. If rural communities do not have a Wal-Mart, dollar stores are often people’s sole source for many products — which could increase perceptions of the stores’ positive impact. Suburban residents do not value dollar stores’ community imprint as much as their rural neighbors. None of the dollar stores make it into suburbanites’ top 10 brands with a positive community impact. “‘Community’ means something very different when your physical shopping environment is mixed with your housing — something that suburban people have that rural people don’t have,” Hyman said. Dollar stores signify a different kind of economy: one that is poor and working class. Homeowners don’t want that sort of signal near their homes, he said. “If you’re rich, you can always shop in cheaper places. But you don’t necessarily want that to be how your neighborhood is understood,” Hyman said about the locations of dollar stores in suburban areas. Suburban home values are also less stable than those in rural locations, according to a 2016 Zillow report, which might make residents there more anxious about how neighboring plots could impact the price of their home. There are very few stores that have access to national suppliers in rural communities. Undesirable appearances aside, there’s no sign of dollar stores slowing down. Both Dollar General and Dollar Tree have a spot on the Fortune 500 list. Both companies report net quarterly incomes of more than $230 million, either doubling or tripling their quarterly results from a decade earlier. While Amazon is not an official measuring stick, a Morgan Stanley report released in September found that investors were most likely to say it would take Amazon the longest to “materially disrupt” dollar stores compared to other consumer markets such as food retail or home furnishings. “This is one part of retail that has done a lot of very interesting things under the radar: they provide good value to lower-income households and they’ve provided support to lower income communities in, what I think, are pretty innovative ways,” Strong said.